Another Mexican-style food that tastes great and can be made at home. Low Carb Crunchastic Supreme like at Taco Bell. This is a meal that ends up being less than 10g net carbs and tastes great. This is a low-cal version of a Taco Bell favorite at home. Roll up your sleeves, chica, and get busy! Using a fork or knife, break up the chicken so there are no large chunks. In a small microwave-safe bowl, combine chicken, cheese, taco seasoning mix, and cayenne pepper, and mix well. If you like, season to taste with extra cayenne pepper. Microwave for 30 seconds, or until cheese begins to melt. Set aside. Warm the tortilla in the microwave for 10 seconds (making it easier to fold without ripping), and then lay it out on a flat surface. Place the chicken mixture in the center of the tortilla. Flatten the mixture into a circle, keeping it about 2 inches from the outer edge of the tortilla. Next, layer the tortilla chips on top of the chicken mixture. Evenly top with sour cream, lettuce, and tomato. 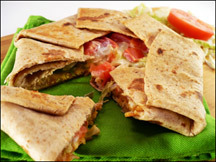 Bring a pan sprayed with nonstick spray to medium heat, and carefully place the folded tortilla in the center of the pan with the folded side down. Heat for 4 – 5 minutes, until the tortilla is browned. Carefully flip it with a spatula, and heat for another 30 – 60 seconds. Now chew it up! 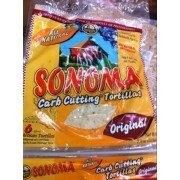 Trader Joe’s Sonoma Low-carb tortillas. 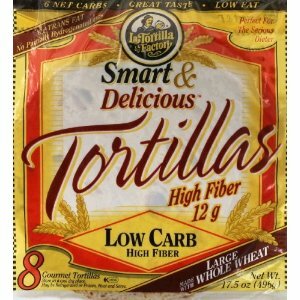 This is an example of low-carb tortillas. this one is at Costco and Markets.